EIA captures the capacity, fuel consumption, and electric generation of generating units in its Annual Electric Generator Report. EIA uses an identifier called a unit code to group the component units of combined-cycle power blocks to help understand their design and operational characteristics. 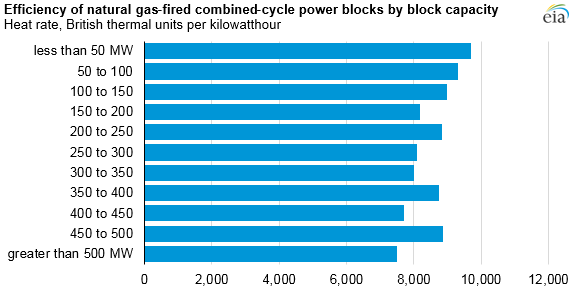 Most of the installed capacity of natural gas-fired combined-cycle units comes from power blocks that have capacities of 600 MW to 700 MW. Of the 644 natural gas-fired combined-cycle power blocks installed nationwide, 16% are within this range. 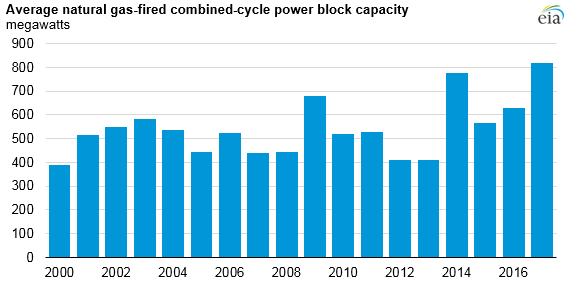 In 2017, two-thirds of the power blocks installed that year were 600 MW or higher, helping to drive the increase in average capacity when compared with power blocks installed in earlier years. Factors such as operating cost and performance affect the sizing of a combined-cycle power block for a particular application. The heat rate of a generator, measured as the amount of British thermal units (Btu) required to generate a kilowatthour of electricity, is the metric most commonly used to represent the efficiency of commercial generators. Smaller power blocks still play an important role in providing electricity. Generators have a minimum output level—known as minimum load—below which continued operation creates risks of instability, inefficiency, and high emissions. Smaller blocks, which inherently have lower minimum loads, are commonly associated with greater flexibility because they can operate through low demand periods without having to shut down. You engineers are all the same. I bet you dream about this stuff at night. I know where you were going with this.